A veritable feast. That’s what these two recipes are. They really hit the spot. I stumbled across these two a while ago and thought I should try them sooner or later. Both sounded more than a little intriguing. The chicken recipe was actually for chicken wings, and used some ingredients I switched out, and some I left out. So let’s call it an inspiration recipe. It’s certainly not a rip-off (or I would tell you so…). The corn recipe was a footnote someone left. “You can also try…” No amounts or directions – just an offhanded hint. I think (or at least I hope) I “improved” it. The recipe started life as a marinade for chicken wings. 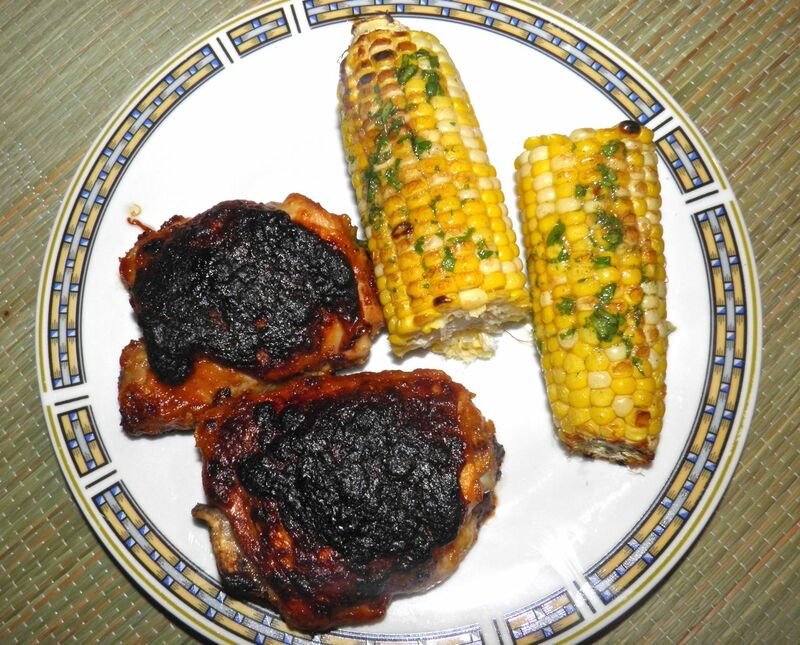 But I even switched out the cut of meat (to thighs) and used it as a basting sauce. I also brought the leftover sauce to the table. Waste not, want not. The sauce was thick, sweetish without being overly so, and very, very garlicky. I actually bought two hard neck loose garlic from Argentina (I know, I know…) instead of the three pack of white Chinese -origin garlic. There is a difference. I found the hard neck garlic very much stronger. That was good for me to discover. Two hard neck were about the same cost as the 3-pack of Chinese, and about the same physical yield. They're bigger garlic. Suffice to say that the sauce was amazing on the chicken. When one thinks of garlic chicken it’s usually a Chinese recipe. This most certainly is not. 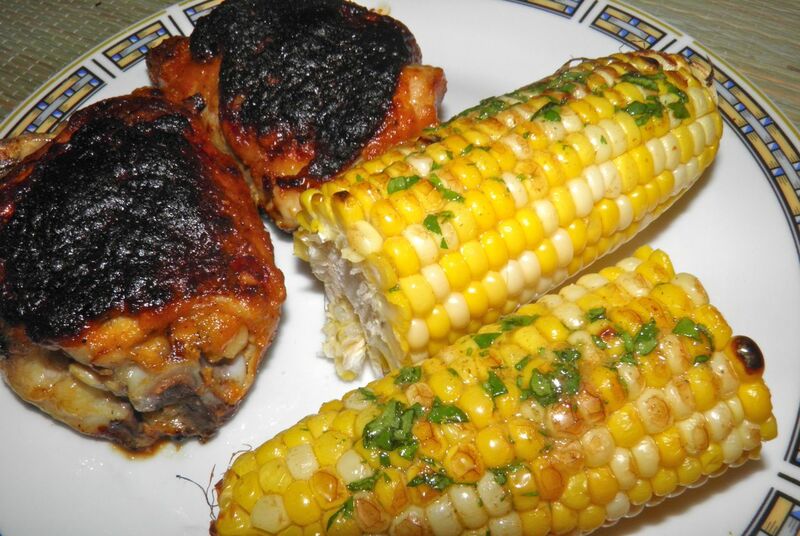 Corn is also making the rounds as a cheap dinner ingredient right now. Local corn hasn’t come onto the market yet (once again, I know…), but at $1.50 for 5 who can pass it up? 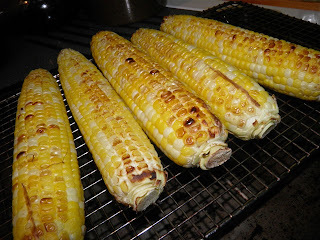 For a different twist from boiled, I opted to broil the corn in the oven. If you remember, I am BBQ-less until we move, so that’s my work-around. Both these recipes would be stellar done on the BBQ, charred to perfection. Try these recipes. You could do both on the BBQ just as easily as in the oven. Easier, probably. Directions for both methods are below. This corn is so easy, and so good. Purée the cooking sauce ingredients. 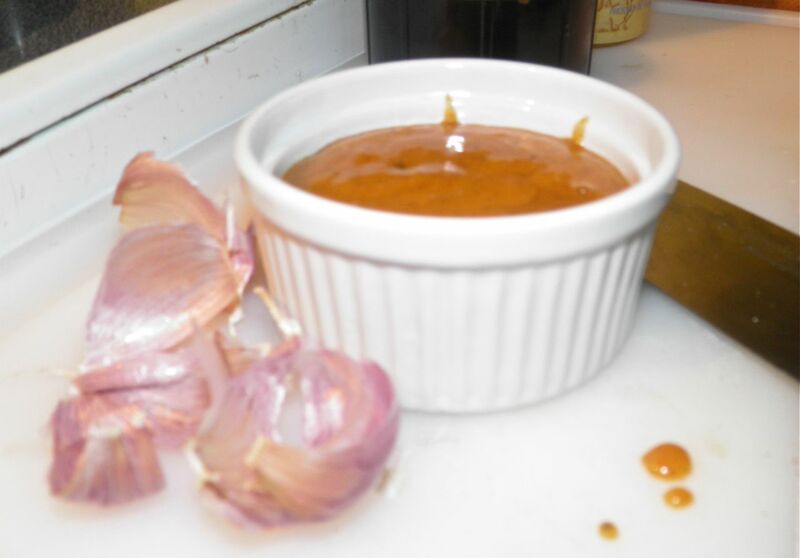 The result will be a thick, orangey sauce. Yield is about 1/2 to 3/4 cup. If using a BBQ, you can marinate the thighs for 1/2 hour in the sauce to boost the flavour a little. But do not bring any excess to the table, as it will be contaminated by raw chicken. Grill the chicken on both side until done, painting the thighs with additional sauce as they cook. If working indoors, preheat the oven to 350°F. 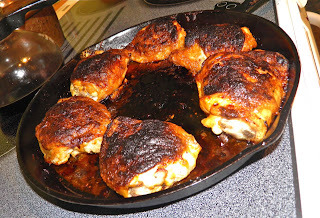 Heat a cast iron (or other oven-safe) pan on the stove. Fry the thighs, skin side up, until the chicken releases from the bottom of the pan. Paint the tops of the things with the sauce. You will not need to add any oil. Fat will render out when they cook. Turn the thighs skin side down and paint the bottom of the thighs. Once the skin side has browned nicely, flip the thighs skin side back up and place the pan in the oven. If you have a lot of fat drain some off before finishing in the oven. Let the thighs cook until an internal temperature reads 180°F, about 15-20 minutes. Meanwhile… work on the corn. This is simplicity itself. Clean the ears of any husk and silk, place on the BBQ or right on the rack in the oven a few inches from the element. Once one side is slightly charred flip and do the other side. It will take about 4-6 minutes per side. Mix the softened butter, cumin powder and cilantro together and bring it to the table. It’s wonderful with the corn.